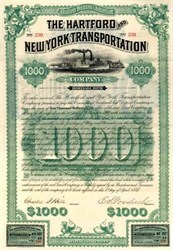 Beautifully engraved SCARCE certificate from the Hartford and New York Transportation Company issued in 1887. This historic document was printed by the American Banknote Company and has an ornate border around it with a vignette of a river boat. This item is hand signed by the Company’s President ( E. S. Goodrich ) and Treasurer and is over 130 years old. 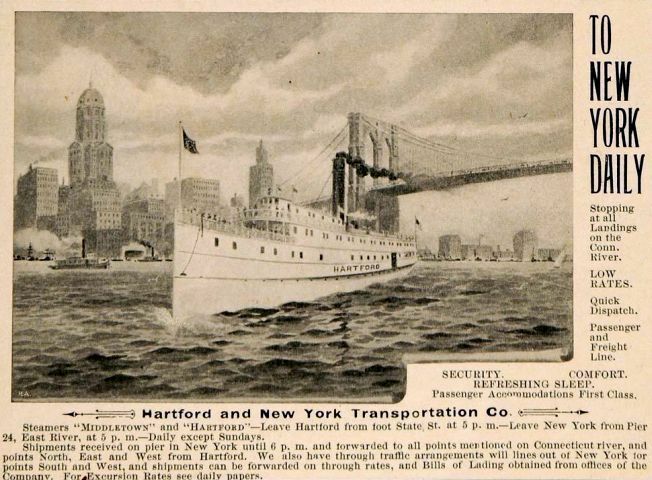 The Hartford & New York Transportation Company was organized by Charles C. Goodrich in 1877 as a towboat company/steamboat line, and established passenger service to New York in the 1880's. It was acquired by the New York, New Haven & Hartford Railroad in 1906-1907, but remained independent of the New England Navigation Company. Service terminated in 1931. The company operated coal barges and Passenger Steamship Lines between Hartford and New York, and New York and Providence. The company owned the Maine Steamship lines. Control over the company was obtained in 1906 by the Hartford and New York RR Company. New York, New Haven, and Hartford RR was commonly called the New Haven RR. Between 1872 and 1920, when dozens of small railroads were completed under the direction of financier John P. Morgan and company president Charles S. Mellen, the railroad’s holdings were vastly expanded to include c.2,000 mi (3,220 km) of tracks throughout New England, intercity electric railroads, steamship lines, and public utilities. In 1913, the New Haven faced financial catastrophe, and in 1914 the railroad’s operations were investigated by the Interstate Commerce Commission. Hurt by the growth of automobile and truck transportation and by the depression of the 1930s, the New Haven went bankrupt. It prospered during World War II under new management but collapsed in the late 1950s because of unprofitable passenger service. In 1968 the railroad, having been reorganized, merged with the newly formed Penn Central Company.